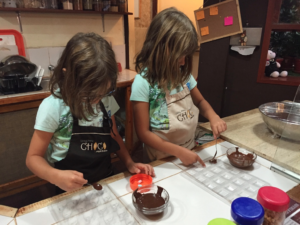 Peru with Kids: Lima - Huaca Pucllana, Chocolate Making & More! 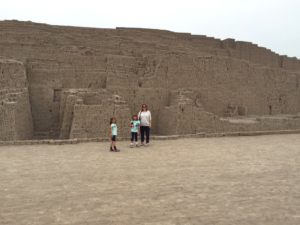 Peru with Kids: Lima – Huaca Pucllana, Chocolate Making & More! We landed safely in Lima, Peru, our first stop on our 6 month Round the World family adventure. We wanted a couple of days in Lima to acclimatize before heading to the higher altitude of the Sacred Valley. I didn’t have anything specific planned in terms of activities and wanted to keep our first day low-key since we had just flown in that morning. 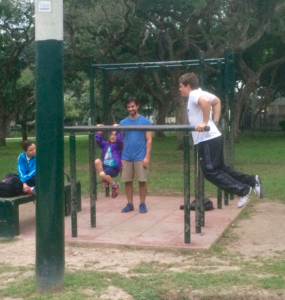 Amy & a Lima resident working out. 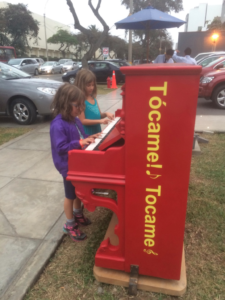 Amy & Hannah playing piano on the streets of Lima. As we wandered the neighborhood, we came across a public piano, so the girls tried it out! That night, we had the fun experience of trying to order food in Spanish. Anthony wasn’t exactly sure what he ordered, but it turned out to be delicious! The next morning, Anthony went to make eggs, but didn’t realize there was a glass cover over the burners. We had never seen a stove with that before, so ended up damaging it. Not a great start to our first Airbnb stay! We paid for the damage, and all was good after that. 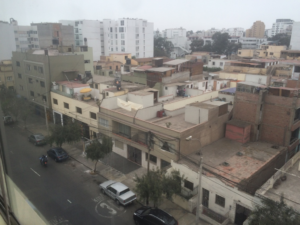 On our second day in Lima, we went to a few of the sites in the Miraflores neighborhood. First, was the Huaca Pucllana Museum and Archaeological Site. There you can see an adobe and clay pyramid build by the Lima people between 200-700 A.D. It was fascinating to learn more about the Limas, and I recommend the tour. It is not too much walking, and was easily doable for my girls. 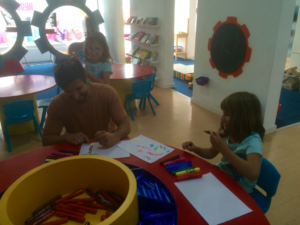 After that, we came across an indoor play space for kids on Avenue Comandante Espinar which the girls loved. 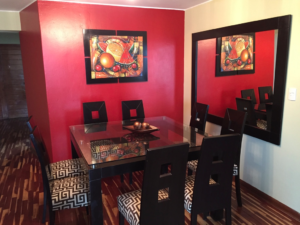 It had several different areas of play such as art, construction, music, and a play store and kitchen. Lastly, we went to the ChocoMuseo, where the girls learned how chocolate is made, and got to make their own chocolate (yum, yum)! All in all, it was a good couple of days in Lima. Tomorrow, we fly to Cusco in the morning, and head straight to our Airbnb house in the Sacred Valley. pay a quick visit to the site, that’s what this site is providing.